After decades of decline, many historic downtown districts across America and Alabama are again thriving, and it’s happening with gusto in Opelika. Until recently, downtown Opelika hid a century of history behind its neglected facades. Renovated buildings now sport colorful awnings and new coats of paint the color of Necco wafers. Today, vacant and unmaintained historic properties are thriving as restaurants, art galleries, shops and offices. It indeed takes a village to revitalize a village—federal grants, Main Street programs, chambers of commerce and tourism bureaus. But it’s the private investor who breathes new life into a fading downtown. In Opelika, John Marsh came forward to perform CPR on the city’s commercial district. While downtown Opelika was hardly a ghost town about six years when Marsh started buying buildings in need of tenants and TLC, it was a far cry from its current invigorated and revamped self. Buying into a lackluster downtown takes a leap of faith and plenty of mettle. John Marsh loves to save buildings, but he also loves to save and reuse bits of buildings, mixing slices of an area’s history into a new business. 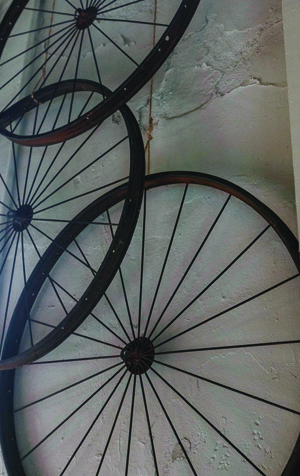 Wagon wheels decorate the walls of his Overall Company building. Today, Marsh operates JMarsh Enterprises Inc. and his many other companies out of an old building he owns in the heart of downtown near the Lee County Courthouse. Opelika’s downtown district is now listed on the National Register of Historic Places and Marsh remains active in its ongoing renewal. When investors step in to purchase property, the entire landscape and attitude improves, Powers-Smith observes. Even when buildings remained empty until occupants could be found, confidence in downtown Opelika’s future was instilled and a sense of hope that something good was about to happen. Marsh’s entrepreneurial nature emerged long before he began investing in downtown Opelika. The 41-year-old Albany, Ga. native was still a teenager when he started a business installing high-end audio systems. In his early 20s, he moved from Albany to Auburn, where he met his wife, Ashley, and started a salvage yard and also restored luxury automobiles and SUVs. In 1995, the couple purchased an 8, 000-square-foot 19th century Victorian-style house in Albany in danger of demolition, which they dismantled and moved to Opelika. JMarsh Enterprises and Historic Possibilities grew out of this project. Materials salvaged from early structures can be purchased in his downtown Opelika showroom, along with furniture, such as plantation tables and beds that Marsh has custom-made from reclaimed materials. The interior stairs are repurposed from a closed LaFayette mill and tabletops are crafted from saved metal. 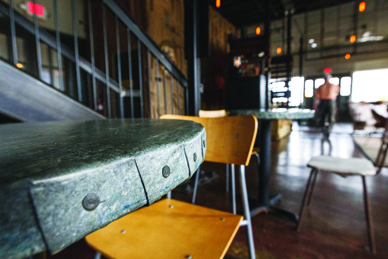 Once an overall factory, the building is now home to The Overall Company, a specialty eatery with live entertainment. Marsh is up at 4:30 a.m. and puts in 14-hour workdays, and time off is spent with Ashley and their two sons. When pressed to name a hobby, he mentions the joy of rummaging through antique shops. Yet his love for old stuff is really part of the job. And being the quintessential entrepreneur, he’s driven by passion with little distinction between work and play. On a recent hunt, he found a vintage vacuum cleaner he’ll recycle into a lamp. His businesses have grown to include managing about 100 rental properties he owns in the Lee County area, and starting several companies focused on media, Internet and advertising. He’s also involved with non-profit groups that help low income children learn to read and write. While independence is a fundamental trait entrepreneurs share, successful ones know when to listen to others. Marsh credits several prominent businessmen who nurtured him along the way.